Ah yes. I have a KIA Soul with a fancy tablet interface and voice controlled Radio. I hate it. The touch screen is very distracting to use while driving. And the voice control does not work half the time because I do not have a South Korean accent. Give me knobs and old fashioned push button radio any day. I'm kind of surprised that SDRs are so expensive. Eliminating the front end of something like a Flex should make it much, much cheaper to design and manufacture than a traditional radio. It's more that traditional radios are abnormally cheap. Something like an IC-7000 for a bit more than $1000 is an awful lot of radio functionality in a fairly small box. While the boat anchor folks are justly proud of their units, in real dollars, you spent a lot of bucks for not much in the way of performance. After that, it's all about mass production. You need fairly high volumes to get the price down. But even with that, it's hard to get the parts count really down. Sure, one can build a minimalist radio with very few parts (look at the $20 USB tuner based radios), but there will be some performance issues. On receive, wide open front end means that strong adjacent signals will cause problems. On transmit, you need output filters for harmonic suppression, and it's hard to get really good carrier/image suppression. Getting 100W RF power from 2-30 MHz is also challenging at low cost, even with crummy performance. It all adds up. And it all takes different pieces of the puzzle, so there's not as much to be gained by higher levels of integration. It's not like you can integrate the HF power amp with the required output filter and put it all on one die in one package. Even things like power supply bypass capacitors and biasing stuff adds up. The block diagram may only have half a dozen "building blocks", but each of those requires 10-15 passive components hanging around it to make it work. That said, I think there is scope for some clever design that has not seen the production light of day. The merging of software control that can compensate for DAC and PA non-ideal behavior, and manage things like bias and power supply output on the fly might make transmitters simpler, more efficient, etc. But that is hard to implement successfully. Sure you can do cartesian/polar modulation, but it tightly couples the power supply design, the power amplifier, and the low level outputs, whcih makes the design of all of those more tricky. You don't get to leverage the last 50 years of transistor amplifier design as much. It's always amazing to witness the utterly obtuse ignorance of reality with those who can't seem to understand that with a Flex or any other thick pipe SDR, the PC that controls the radio is part of the radio, not some incidental ancillary function of your main PC that you use for Facebook and playing Farmville on. There is absolutely no precedence set by the manufacturers saying that you should not invest in a dedicated PC for controlling your SDR, nor is there any anecdotal evidence of merit that makes that assertion with any sort of validity. You wouldn't expect to use your Yaesu FT-2000 front panel for logging on to Twitter, so why would you expect to use your Twitter capable PC to run an SDR? The other consideration (in my opinion) is that the majority of hams still want transceivers that are self contained, transportable, and relatively easy to operate. Having a box connected to a PC along with remote tuning and control devices plus dealing with loading and configuring software, drivers, etc. doesn't really lend itself well to that requirement. Exactly correct. Window Computers were never designed or meant for real time applications like Hamradio. Which of course is one the reasons Flexradios and other SDR's will never be mainstream hamradios. K5TED my experience with most of my Flex rigs (I've had 2 1000's, 2 1500's and 2 3000's) has been nothing but frustrating. These radios should have have the CW function blocked on PowerSDR. Yes I was using a super duper fantastic computer with a zillion megabyte processor with the highly blessed and completely obsolete Firewire interface (unless you're into the music scene). And yet now it's been proven by the HpSDR folks that PowerSDR IS capable of working with Ethernet. Which completely eliminates the CW lag using my Anan radio which runs on an old POS computer with no issues. Press Key "DIT".........................................................................................(wait for it)........................................................................................"Dit" (going out over the air). PCs are very good at "real time" data stream processing, as long as you are matching your hardware specs with the needs of the software you are using. My home desktop computer could process a full SDR stream, play a high end 3D video game, and capture live video from a video camera all at the same time, without even breathing hard. Granted, I built my machine to be a monster, but the reality today is that our computer hardware largely exceeds the demands of today's software. Especially with quad and hex core processors, cheap memory, and fast hard drives. Another aspect of problems with SDR seems to be people trying to get them to run on old hardware. I've only been around here for a short time, but from what I've seen of ham shack photos, and people talking about their computers, there is a lot of ancient computers still being used by hams. For about $500-600 you could build a new computer with a mid-grade quad core CPU, 8gigs of ram, and a decent hard drive that would process SDR streams and more with no problems at all. For kicks, here's a picture of my latest build. 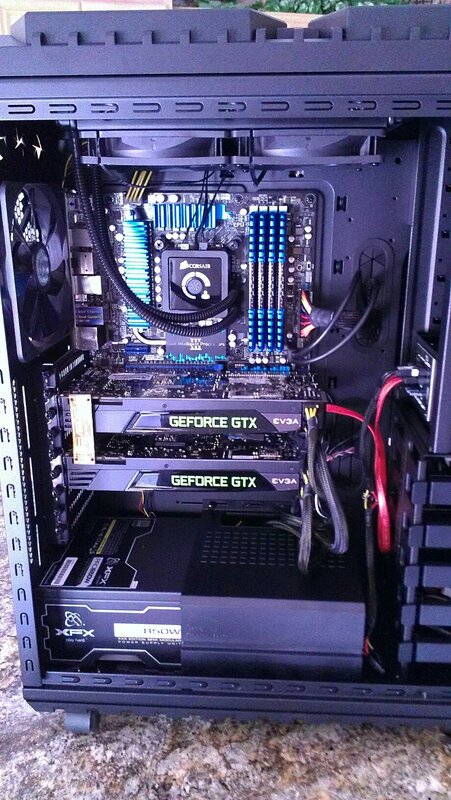 I gave myself a $2000 budget to set up a nice gaming rig this year. I spent $3K on my last one a few years ago, but hardware is cheaper and much more powerful now. Uses a lot less power too. I also wanted to add that as far as latency/lag goes for things like CW, using DSP instruments and effects plugins on computers demand low latency as well, in the range of 1-3ms. If there is a delay, there could be problems with either the computer's ability to keep up, or latency issues/bugs in the software being used. This is a very subjective situation. Not all firewire controllers are equal, and if the SDR needs a sound card, there are varying degrees of performance in that area too. Coming from video gaming on PC's, I would go out and get a good Soundblaster sound card, and purchase a low latency firewire controller like the ones used for music and video production. I agree that Firewire is obsolete and should be abandoned. Thunderbolt should be considered. The problems with PCs in radio, and elsewhere, come from people not paying attention to minimum system requirements for their application. Not so. Desktop Windows is not a RTOS real time operating system. Use Google, he is your friend and you can also find some RTOS that will do Real Time. I tried 3 different computers on PSDR. A full blown i7 with all goodies and fasttt, an i3 laptop loaded and and another computer which I had laying around and do not remember what it was but it was over bare minimum requirements. I also tried a dedicated PC for PSDR. I also tried WIn 7, Vista and Win XP, and Win ME none of which made any difference. As long as Windows uses interrupts SDR software will suffer. Latency, no matter how short affects SDR software. It also made sending CW next to impossible without using an external keyer or (ugh) a keyboard. I also had to try a couple of different Firewire cards as PSDR only likes one particular chipset of Firewire. You do remember Firewire. PSDR was also very particular on how you treated it. I lost count of how many times I had to reset the database and or reboot. when you own a Flexradio you must have patience and learn how to jump thru hoops.. These radios should have have the CW function blocked on PowerSDR. Yes I was using a super duper fantastic computer with a zillion megabyte processor with the highly blessed and completely obsolete Firewire interface (unless you're into the music scene). Yep. Flexradios are for SSBers only as I have said many times on this forum. I got rid of my 5K for several reasons and CW performance was at the top of the list. I tried 3 different computers on PSDR. A full blown i7 with all goodies and fasttt, an i3 laptop loaded and and another computer which I had laying around and do not remember what it was but it was over bare minimum requirements. I also tried a dedicated PC for PSDR. I also tried WIn 7, Vista and Win XP, and Win ME none of which made any difference. As long as Windows uses interrupts SDR software will suffer. Latency, no matter how short affects SDR software. It also makes sending CW next to impossible without using an external keyer. Stan, you do realize that the entire music and movie industry uses Windows and Mac (mostly Mac) for production, yes? ProTools is one of the most well known software suites for production, and it requires very low latency for timing with digital instruments, recording equipment, synthesizers, DSP plugins and effects, etc. Unless you think CW requires less than a few milliseconds of latency, then I don't really know why you think you need a special operating system. I want to be clear that I am not defending Flex here. I've never touched one. I'm speaking in terms of computers and somewhat similar low-latency uses for them all over the world. I want people to understand that standard desktop computers are more than capable of doing very low latency operations with external hardware. If this wasn't true, then they wouldn't be used for music and movie production. Flex's software/hardware may have issues with CW, I don't know, but that wouldn't be some inherent flaw with PCs that I'm aware of. I'd be interested to see Flex SDR's latency numbers, if anyone has a link. Surely they have been tested with CW. There's quite a bit more to it than just having fast hardware. Your software architecture AND the connected hardware needs to be appropriate for the OS. Windows does provide fairly good near real time multimedia support. However, there's a substantial learning curve on making it play right, and to date, very little ham generated software has made the necessary investment. Instead, they tend to take wrappers and libraries which *almost* get there and "leave the rest as an exercise for the reader" in good open source tradition. It's an expensive proposition to write high quality real time device drivers and the supporting software for Windows (as in multiple work-years of effort). If you're selling millions of dollars worth of "Call of Duty" or "Skyrim", you can afford to work through all this stuff (and even those guys don't do a perfect job.. there's plenty of bugs in those too). It is not likely that you're going to get good open-source/free (as in beer) code for Windows to do this stuff, for a variety of reasons, so we wind up with strange hybrids (PowerSDR is an example of such a hybrid) that blend code from a variety of sources and target platforms (dttsp, the DSP core of PowerSDR, was written for *nix type platforms, for instance). However, I wouldn't agree with IUQ that ham SDR won't ever be good on a PC. PC user models are evolving. There are more and more people who understand how to write good real-time code on Windows, and Windows itself is getting smoother. Especially if we get rid of the insistence on legacy compatibility that will help. "I want it to run on my old Win 3.1 machine!" That said, the near term future for SDRs that use PCs is to have the PC embedded in the radio. Then, the PC can be dedicated to the needed functions, just as embedded PCs are used in oscilloscopes, spectrum analyzers, etc. PC mobos are cheap (<$100) compared to the cost of a fancy ADC/DACs or FPGAs. Surely they have been tested with CW. The end user tests Beta Software for Flexradio. Which is one reason there are so many unhappy and EX-customers. Flexradio stopped calling their software Beta. Now they use that much better description of "Preview Edition" for the 6000 series. Unless you agree to use Preview Edition software they will not sell you a radio at this time. I bought my Flex 5K in 2010, almost 3 years after it's introduction. PSDR still was not polished software with basic Features such as a notch filter or FM mode or FSK mode completely missing. I agree with this in general. My guess is that the problems with CW have more to do with the limits of the Flex, either in the software and/or hardware. You covered my main point, which was to say that the problems people are experiencing with latency on SDRs isn't due to some inherent problem with PCs, or their operating systems. I'm not against the idea of having the radio do all of the heavy processing + thin client capability either, though I would wonder if this would possibly limit future development of new experimental features in radio. My main interest in SDR is having the larger screens and the potential for custom controllers, not to mention homebrew and experimental software development for radio. It would be interesting to have some coders who write digital instrument and DSP-plugin software for music production take a look at SDR latency and comment on it. These problems (or similar ones) may have already been solved, complete with open source code projects to learn from. I hear you on this one, Stan. This has become a common practice in some markets with PC software. One definitely needs to weigh the pros and cons when purchasing a product from a company with only beta/preview software available. I'd like to say that we can bet they will sort all of this out in time, but I don't know them that well, and in my professional life, I deal with software that is in a constant state of beta all the time. Some of these programs cost multiple tens of thousands of dollars too, but they get away with it because they are the only game in town for a niche market.